Photos courtesy the Seattle Seahawks and the Denver Broncos. With just days to go before the biggest game in the National Football League – and arguably the nation – three College of Public Health and Human Sciences alums are gearing up for what is sure to be the highlight of their careers. David Stricklin and CJ Neumann will represent the college at Super Bowl XLVIII in New Jersey as assistant athletic trainers for the Seattle Seahawks, and Vince Garcia as an assistant athletic trainer for the Denver Broncos. Although on opposing sidelines, the three say they’re proud of each other for achieving this high degree of excellence in their field – and wish each other luck in the game. Athletic Training faculty member Mark Hoffman says on top of being standouts in their classes, all three were highly regarded by their instructors and set a great example for future students. The three will soon join OSU Head Football Athletic Trainer Ariko Iso – CPHHS alum and former Pittsburgh Steelers assistant athletic trainer who worked in three Super Bowls with the team – as members of an elite group of CPHHS grads who have made it to the Super Bowl. Success in life isn’t measured solely by how smart or talented you are – it’s also determined by how much you stand out among your peers. 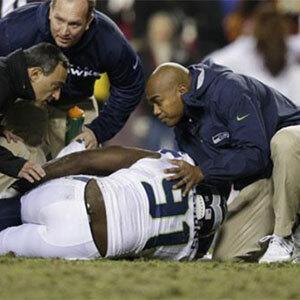 At least that’s the lesson both Seattle Seahawks athletic trainers learned. While David Stricklin pursued a master’s degree in EXSS and a minor in public health, he spent a majority of his time as a graduate assistant athletic trainer with the OSU football team. He was later hired as an assistant athletic trainer with the Oregon State football and baseball teams in charge of coordinating healthcare, injury prevention and rehabilitation for the baseball team and assisting Barney Graff with the football team. CPHHS alum, Seattle Seahawks Assistant Athletic Trainer David Stricklin. 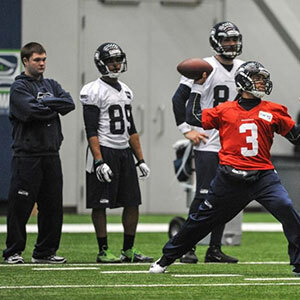 Photo courtesy the Seattle Seahawks. His hard work paid off, earning him an internship with the Seattle Seahawks, which ultimately turned into a full-time assistant athletic trainer position with the team and the chance to join them at Super Bowl XL in Detroit. That’s exactly what EXSS alum CJ Neumann did. During his senior year in the CPHHS, he requested and was assigned to work alongside David, whom he says has been and continues to be influential in his growth as an athletic trainer. CJ landed a graduate assistantship at Arizona State University after graduation and he worked as an athletic trainer with the football team. CPHHS alum, Seattle Seahawks Assistant Athletic Trainer CJ Neumann at practice with the team. Photo courtesy the Seattle Seahawks. 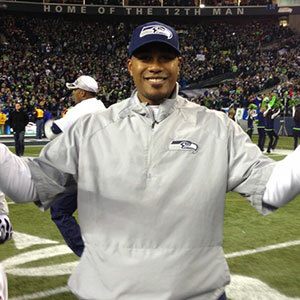 Afterward, he contacted David, who had recently been hired as an assistant athletic trainer with the Seattle Seahawks. 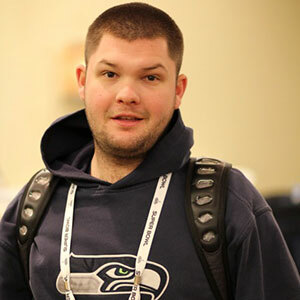 He suggested that CJ pursue an internship with the NFL, and thanks to David’s influence the Seahawks hired him as a seasonal intern for the 2011 season. As the season neared the end, CJ landed a job with the Seattle Mariners as a minor league athletic trainer assigned to their AAA team, where he previously completed an internship. Before the baseball season was over, however, he got a call from the Seahawks asking if he would be interested in coming back as an assistant athletic trainer. Seattle Seahawks Assistant Athletic Trainer CJ Neumann. Photo courtesy the Seattle Seahawks. David and CJ say working in professional football is a daily grind. Their days start off around 6 a.m, typically don’t end until about 7 p.m. and entail everything from setting up for practice, conducting and preparing treatment and rehab plans for the athletes, performing administrative work, taping and keeping on their toes during practice. David Stricklin (right) working with an injured Seattle Seahawks player. Photo courtesy the Seattle Seahawks. Now, on the verge of the most important game in the NFL, preparation is key. But their roles during the big game fundamentally won’t change. So, how will the medical staff celebrate if the Seahawks win the Lombardi Trophy? “Pre-planned post game party at our hotel, and I’m going to wear my ring 24-hours a day for the first month – after that it will go in a safe maybe,” David says. As a competitive athlete growing up in southern Colorado, Vince Garcia always knew he wanted to stay close to competition and sports. When he realized he could do so as an athletic trainer, he jumped on the opportunity and never looked back. A star in his class, he was selected as one of five interns for a training camp internship with the Denver Broncos during his junior year at the University of Northern Colorado. 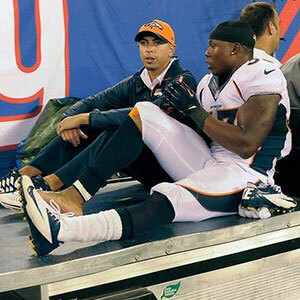 CPHHS alum, Denver Broncos Assistant Athletic Trainer Vince Garcia helps train the team during practice. Photo courtesy the Denver Broncos. Later as a grad student in Exercise and Sport Science at Oregon State, Vince spent much of his time working as an athletic trainer with the men’s soccer team. After graduation, he landed a job as a seasonal intern with the Broncos. Shortly after, a full-time position opened as an assistant athletic trainer with the team. It’s a dream that doesn’t come without passion. Working 11- to 13-hour days, seven days a week for a good part of the year takes a strong commitment to the profession. Photo courtesy the Denver Broncos. So what does a typical day at the Broncos look like for Vince? Much like David and CJ working with the Seahawks, Vince starts treatments for injured players around 6:30 a.m. That’s followed by administrative work while the athletes are in meetings. Then, he sets up the fields, tapes players’ injuries and gets ready for practice. That, of course, is followed by hours of practice where he’s alert and prepared to help with any injuries. After practice, he does more treatments and gets ready for the next day. And it’s something Vince says the CPHHS helped prepare him for. Now, as he heads into the biggest game of his career thus far, Vince says he’s nervous, anxious and above all excited for what’s to come. 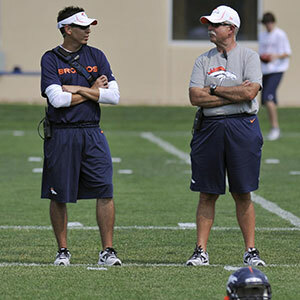 Broncos Assistant Athletic Trainer Vince Garcia (left) with the head athletic trainer. Photo courtesy the Denver Broncos. 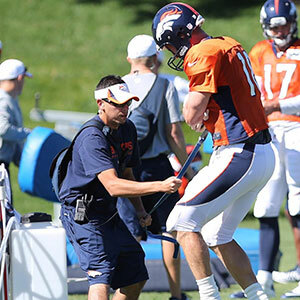 Game-day preparations for the Broncos’ athletic trainers started several weeks ago and included everything from packing their equipment to practicing. Although most everything remains the same in regards to his job on Super Bowl Sunday, Vince says he couldn’t be more proud of the team. Although he doesn’t have any specific plans to celebrate if the Broncos win the title, Vince says this game is one he will never forget – regardless of the outcome.